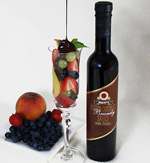 Drizzle Anette's Sauces over your favorite Ice cream.....cheesecake....fruits.... or create a Marvelous Chocolate Martini ! Anette's has created the ultimate in dessert toppings. Chocolate Cabernet, Classic Chocolate Port, Belgian Chocolate Brandy, Chocolate Raspberry Liqueur, Chocolate Amaretto and a luscious caramel~ Butterscotch Scotch Sauce. Sauce ~ 12.5oz by the Case or more (Tall) -- 10% off regular price. Click picture for more information. Regular price for 12 bottles: $239.40. $215.40 reflects 10% discounted price. ($2.00 off each bottle). As you go through checkout, list the 12 + sauces you desire at step 4 in the white box under "Product Choice". Sauce ~ 5 oz by the Case (Mini's) - 10% off regular price Click picture for more information. The price of $107.46 reflects a 10% discount. As you go through checkout, list the 12 + sauces you desire at step 4 in the white box under "Product Choice". Anette's makes their most popular Tall sauces in a mini version. Choose from Chocolate Cabernet, Chocolate Port, Chocolate Amaretto and Chocolate Raspberry Liqueur. All sauces contain 4.8% alc. NetWeight 5oz. Rich Dark Chocolate blended to perfection. This is our only non-alcoholic sauce. Sticky, Chewy, and wonderful over Vanilla Bean ice cream ! For those that enjoy a Dark, Rich and slightly thick sauce, Anette's Merlot Fudge sauce will hit the spot. This is Anette's Darkest Chocolate Sauces which is enhanced with Merlot Wine. Drizzle this sauce over cheesecake, your favorite ice cream or just be creative. Dark 60% Chocolate, Natural Italian Cherries, Merlot Wine ~ a simply fabulous combination. Try drizzling over a rich New York Cheesecake with 3 raspberries and 2 peach wedges as a garnishment. Golden Butter, Caramel, Cream and Brandy are swirled together to create an elegant and dreamy caramel sauce.